Do you ever have a happy accident? I have lots of them. I purchased some crafter’s webbing (2 years ago) with the intent to make a nice wreath for my front door (thank you Pinterest) in white tulle and fancy ribbon with blue polymer snowflakes for winter. Do you know what happened? Yep … I never made the wreath. I guess I’m just not a wreath maker. Long story shorter, in January / February I had a huge studio clearance sale and stumbled about this roll of webbing as I was clearing things out. I didn’t even remember I had it! Sadly, it still had the purchase sticker on it and everything. *Sigh, silly wreath project* Well, I opened it and unrolled it. And you know what it looked like to me? CrAcKle. So you know what I had to do … experiment. So experiment I did. 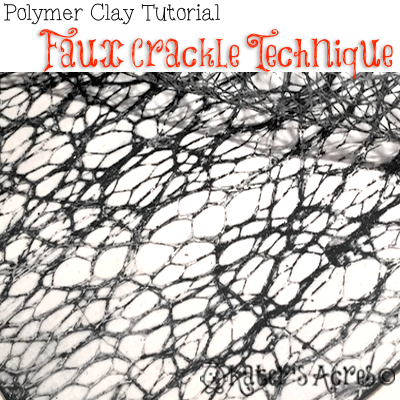 And this is what I came up with … so I hope you enjoy and have fun making your own faux crackle to use on all sorts of things. And if all else fails, you can always make a wreath! Fully prepare and condition the color and amount of Premo! clay you will need. For this example I have prepared one 2 ounce block of white Premo! clay. Cover the entire sheet with the desired color of a medium body acrylic paint. I have used a black Liquitex paint. Once the paint is dry, place the mesh crafter’s webbing onto the sheet of clay. Thoroughly embed into the sheet using an acrylic brayer. You want the mesh to be embedded into the sheet so that it will not easily lift up. Spray liberally with rubbing alcohol from a mister bottle. Use several baby wipes and begin the process of removing the paint from the sheet of clay. You may need several baby wipes depending on how thickly you laid down the paint and how dry the paint is on the sheet of clay. Continue wiping the paint off until you are down to the base layer of clay between the mesh areas. Then slowly remove the mesh from the sheet of clay. What is left behind is a gorgeous “crackle” like pattern that can be used for a variety of projects! The cool part is that as you use this veneer, part of it will truly “crackle” along the paint lines adding an additional level of “cool” to your faux crackle. As a side note, this technique works fabulously with the Faux Collage Veneers Tutorial too. Thanks for including my tutorial in your wonderful article Sage!